Airedale Celing Mounted Air Conditioning Units. Airedale TL 4.4T cassette. New chilled Water Cassette Units. Very good quality units, used in hospitals, gyms, retail shops etc. All units are brand new. FOR MORE INFORMATION ON THIS ITEM PLEASE CALL. MAIN OFFICE : 01202 874858 MOBILE : 07936 795508. RING US TO PAY BY CREDIT / DEBIT CARD. ECONOMY AND NEXT DAY SERVICE AVAILABLE. We are based in Ringwood, near Bournemouth, Southern England. Opening Times - Monday to Friday 8.30am - 5.30pm, Saturday 9.00am - 2.00pm, Sunday Closed. Address - 120 Boundary Lane, St Leonards, Ringwood, Hampshire, BH24 2SF. 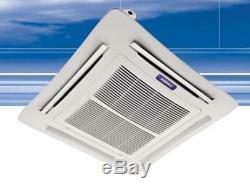 The item "Airedale Celing Air Conditioning Cassette Unit 4.4T kw" is in sale since Monday, May 16, 2011. This item is in the category "Business, Office & Industrial\Office Equipment & Supplies\Office Equipment\Other Office Equipment". The seller is "avonforestautos" and is located in Ringwood. This item can't be shipped, the buyer must pick up the item.